Catering for your guests at your wedding is almost certainly going to be your largest expense. Brides deal with this in a number of ways. Some just limit the number of people they have at the wedding breakfast and invite others for drinks and dancing afterwards. Other brides just have a small wedding. Of course, if you’re having a buffet rather than a formal sit down wedding meal then that is going to reduce your costs. It makes for a slightly more relaxed atmosphere and a greater choice of dishes. It’s a bit easier to cater for vegetarians who are coming to the party. It’s your wedding catering that’s going to use a large chunk of your budget so if you’re thinking about DIY-ing part of it, then that makes sense. Here are a few ideas for you to be thinking about. 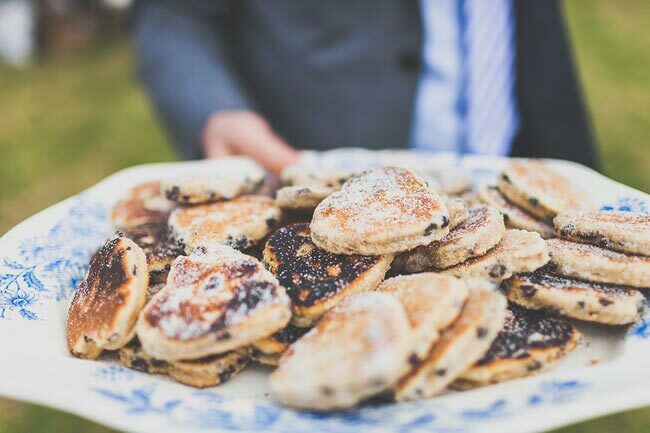 Just remember however that you will require people to serve up the food, dish it out and clear it away so you will probably have to pay for a bit of help – even if it’s just the washer-uppers, because you certainly don’t want to be doing that on your wedding day! You don’t have to serve up a large meal on your wedding day to your guests. If you’re getting married at around 2pm, then you could invite everybody to a slap up tea instead – which is a really easy thing to DIY. An afternoon tea can look wonderful laid out in a marquee prettily decorated with bunting. Plus you can still have traditional speeches and fizz to toast the new bride and groom! You can hire all the china you’re going to need, from pretty bone china tea cups and saucers through to cake stands. 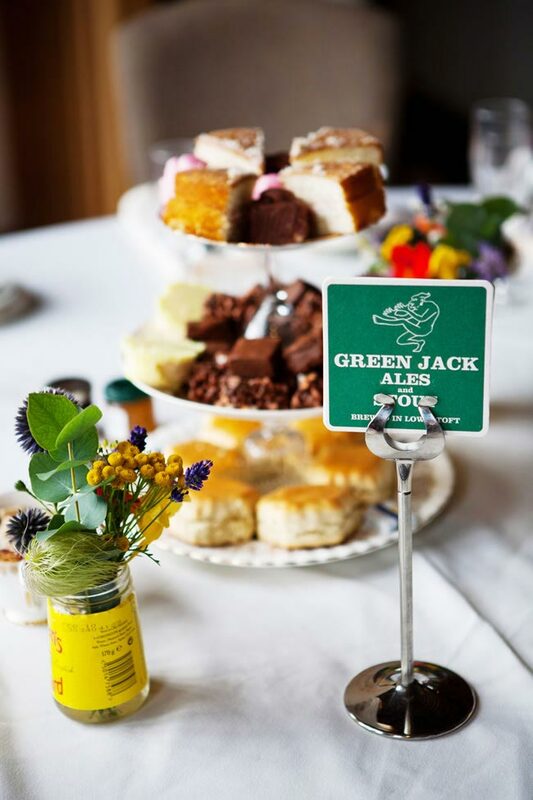 You’ll need to think about who is going to prepare what and you need to keep a close eye on numbers – an afternoon tea works best for a wedding of below 50 or so people. Finger sandwiches are a good start, think of classic egg and cress or maybe smoked salmon, whatever are your favourites. Moving onto the sweeter things, get a baking friend or relative to make you up some batches of scones and offer with dollops of cream and strawberry jam. As for puddings well, you can serve just about anything you want. Why not get your guests to bring their own puddings to share and have your very own DIY desert table? This is the perfect way to DIY your catering if you’re having a rustic-style wedding. Again, work out the numbers of people who will be eating and then plan accordingly. Think about serving cold roast chicken, turkey and other old meats and fish. Then have somebody carving up for the guests as they decide on what they want. Get your cooking friends to each create a salad or two for your guests. You could have a selection of desserts, from a delicious apple pie with cream to chocolate mousse and fresh strawberries or raspberries when they’re in season. If you’re doing this you need to plan well ahead so that the meats are cooked the previous day and stored correctly and the salads arrive and are chilled but not soggy. Everyone love a barbecue so if you’re planning a summer wedding, why not set up some barbecues outside?. Gas barbecues are probably easiest here, just make sure the cylinders are full beforehand and then decide on who is going to do the cooking. This is probably a better option if you don’t have more than about 80 or so guests. Think about the meat you’re going to offer and have a table of homemade salads on a buffet for guests to choose from and a dessert table. If you like the idea of a barbecue but feel uncomfortable asking somebody to do the cooking, then you could have a hog roast Although these companies will also cater the salads and accompaniments you can save yourself some money by doing this bit yourself. If you’d like to buy in some food but still want a bit of a DIY approach, then you could hire a specialist fish and chip van to arrive at your wedding reception with an ice cream van for dessert. If you’re getting married late in the day – then you can have the wedding speeches and drinks immediately after the ceremony and then get on with the party. The fish and chip and ice cream vans can be around in the background ready for hungry dancers to pounce on. This is probably a better solution for a summer or early autumn wedding as you won’t want your guests queuing up outside in the cold weather. Not everybody always wants to eat at the same time so this is a good option if you’d like to stagger the food. None of your guests will mind DIY wedding food as long as it’s delicious and well presented. Unless you’re a professional caterer though, don’t be over ambitious – the best approach is to keep things as simple as possible.